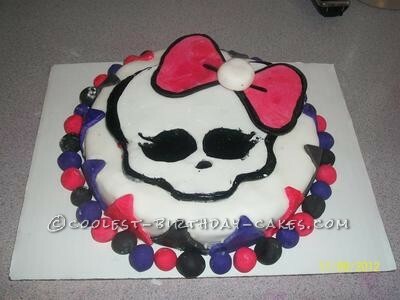 My best friend’s daughter wanted a “Monster High” cake for her 6th birthday. I started out by making the trade mark skull out of fondant. I found a picture on line and blew it up. I traced it on to the fondant with a pairing knife and then cut it out. This one was black. Next I made another skull (this time white and a bit smaller, so the black one acted as an out line) and cut out the eyes and nose. I placed the white on the black and let it harden. Then I made the bow out of fondant as well and colored it pink. I used a medium shaped heart cookie cutter and then just rounded out the edges. I dipped a small paint brush in black dye and painted on the out line). The middle of the bow is a rolled up ball of fondant. I dyed more fondant pink, purple and black and used a triangle shaped cookie cutter to cut out the “argyle” and a small round cookie cutter to make the balls. I left all of this to harden over night. I ended up using the better part of a 5 lb box of ready to use fondant by Wilton. The next day I baked the cake, (9″ home made sugar cookie cake) and after it had cooled I popped it in the freezer. It was a bit shorter than I wanted but I was running out of time. I suggest doubling your recipe. While it was freezing I made the icing (butter cream). I took the cake out of the freezer and covered it in icing, popped it in the fridge to let the icing set, (you don’t have to do this, it’s just to ensure that the icing doesn’t ooze out the bottom), then covered the cake in white fondant. Once the fondant was on I stuck the decorations on with a combination of icing and a small bit of water. The cake was a hit and so much fun to make.